Not so long ago, as a lawyer working for the United Nations, I experienced a dramatic shift in my perceptions of approaches to international human rights and issues concerning the detained and imprisoned. I remember peering through the bars of a cell in Cambodia and talking with a young boy who had been detained, tortured by the police, and was languishing in prison, confused and daunted by what would or could happen next. Like most prisoners in Cambodia, he had no lawyer or human rights worker to defend him or safeguard his rights, and he had no pending trial date to determine his guilt or innocence. I flashed back to ten years before, to my college days of organizing letter-writing campaigns for political prisoners. We had demanded that they be free from torture and be granted their right to fair and speedy trials. But as I came face to face with this young boy, I realized that neither I nor my fellow students would have written a letter for him. He was not a political prisoner; he was just an unimportant 12 year old boy whose mischievous behavior, trying to steal a bicycle, had landed him in this quandary. The prison guards were nice enough and did not appear too concerned that I was talking to this young boy who bore obvious signs of beating. They didn’t have much to hide: after all, use of force to extract confessions was just a part of standard police operating procedures. As I looked into the face of the boy, I felt myself wondering where we had gone wrong. I wondered why his interests, those of a “common” and “undeserving prisoner” had not made it into my “mission” statement. Perhaps ten years ago, there might have been precious little that we could have done for this boy. Since that time, however, governments throughout Asia, including Cambodia, Vietnam, and China have passed new laws outlawing torture and providing citizens with basic rights, including their right to a defender. It was precisely because this boy was not a political prisoner, someone the government had any interest in, that he could easily have been the beneficiary of focused international attention. Citizens like him were unimportant to the government and the denial of their basic rights now had less to do with present policy and more to do with vestiges of an old legal system that formerly tolerated and even condoned this denial of rights. In his face, I recognized the thousands like him, not only in Cambodia but in countries like China and Vietnam as well, who would be the direct beneficiaries of a functioning criminal justice system with a standard of basic human rights. By helping these countries to implement their own domestic laws consistent with human rights principles and helping to safeguard prisoner rights, we had the opportunity to drastically improve and perhaps even save the lives of everyday citizens. 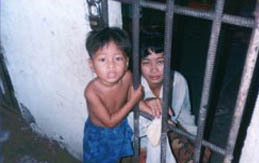 Vishna, a four year old boy who was born and lived in a Cambodian prison is my favorite hero. Because he was born in the prison, the guards who knew him his entire life grew quite fond of him and allowed him free range of the prison. He was small enough to climb through the bars. When I met him, though, he was getting older and could no longer get through the bottom rungs of the prison bars. But he could climb up to the third bar, which was slightly bigger, then slowly turn his head to the side and then find a way to barely pass through the bars to the other side. Everyday that I went to the prison, he would go through this process so he could run out to meet me. Then he would take my hand and go with me to each and every prison cell. At each of the 156 prison cells, he would reach his little hand or finger in to make contact with a prisoner. For most of them, he was their greatest joy. I often think of Vishna. A boy born into a prison without material or physical comfort. But a boy who had a sense of his own heroic journey and desire to give up a piece of his life to something greater than himself. I think of the contributions he made to the prisoners’ wretched lives both on an individual level as he reached out his hand so many times, and also of the contributions he made to human rights through me – for he so often gave me strength when I was not sure why I should continue on. This heroic spirit and journey to reach behind the bars of injustice is open to all of us. Please join Vishna in this heroic journey and let us partake in it together. IBJ’s mission is one of hope and belief in the spirit of every human being, everywhere, regardless of circumstances.